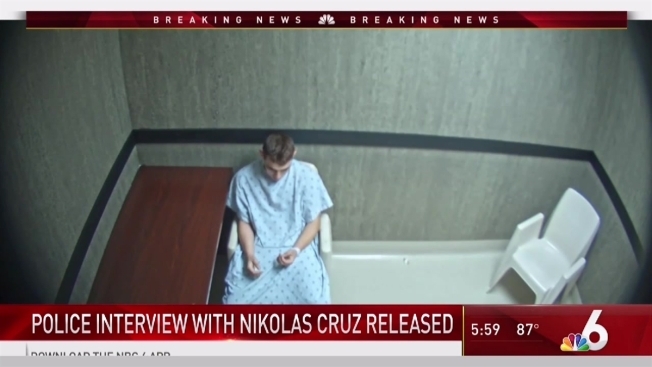 NBC 6's Tony Pipitone looks into the released tapes of Nikolas Cruz' statements to the police after the MSD massacre. Prosecutors on Wednesday released video of the interrogation of confessed Stoneman Douglas High School shooter Nikolas Cruz, redacting the substance of his confession as required by Florida law. Two-and-a-half hours after the Stoneman Douglas shooter was detained, video recorders began rolling at the Broward Sheriff’s Office where Cruz was taken. He would confess his crimes, but also reveal much more, claiming a "demon" voice told him a day before the massacre to "hurt people," and to "burn, kill, destroy." Yet during the interview, Cruz contradicts himself about the "demon." When Det. John Curcio asked him why he chose to buy an AR-15 rifle, Cruz said it was "cool looking." But later, when Curcio asked if the "demon" told him to buy the AR-15, Cruz replied, "Yes." When Curcio challenges Cruz, saying "I think you’re using the demon as an excuse," the killer begins repeating, "No. No. No. No..."
The footage shows Cruz slouching in a chair, being repeatedly urged by the detective to speak louder and punching himself in the face when he is alone. While Florida law prohibits the “substance of a confession” being released until it is presented at trial or the case is closed, the state attorney's office on Monday released a transcript of a large portion of the statement that a judge determined did not constitute the substance of a confession. After making sure the same redactions were made in the video, the office released that to the public, as well. 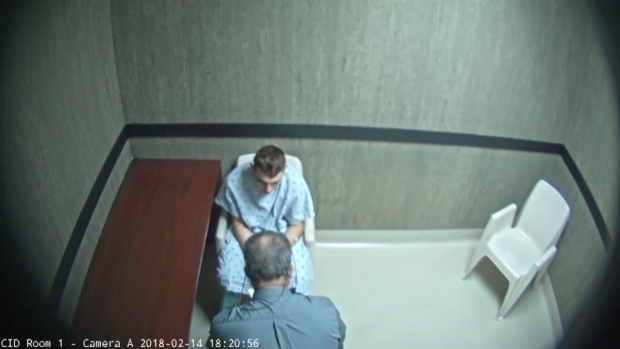 Prosecutors released video of the interrogation of confessed Stoneman Douglas High School shooter Nikolas Cruz, who spoke with Det. John Curcio after his arrest. Cruz's attorneys argued none of the material should be released, saying it would prejudice the public and make it impossible for Cruz to get a fair trial. He is charged with 17 counts of murder and 17 of attempted murder and the state has announced it will seek the death penalty. But, on July 26, Circuit Judge Elizabeth Scherer ruled the defendant "failed to demonstrate that preventing public disclosure of statement is necessary to prevent a serious and imminent threat to the administration of justice," adding a high-profile case does not "in itself give the defendant the right to close the flow of information to the public." She gave the defense 10 days to appeal her ruling, but it did not. While the statement is now public, the judge noted, that does not mean any or all of it will ultimately be admitting into evidence in a trial. Those decisions will be made as the case proceeds. Cruz was detained at 3:41 p.m. on Feb. 14, nearly 75 minutes after he walked out of the 1200 Building at Stoneman Douglas High, leaving 17 people dead or dying in his wake a mile and half away. He complained of trouble breathing and nausea and was briefly taken to a hospital, where his clothing was seized as evidence. He then was walked into the Broward Sheriff’s Office, where Curcio began interrogating him. 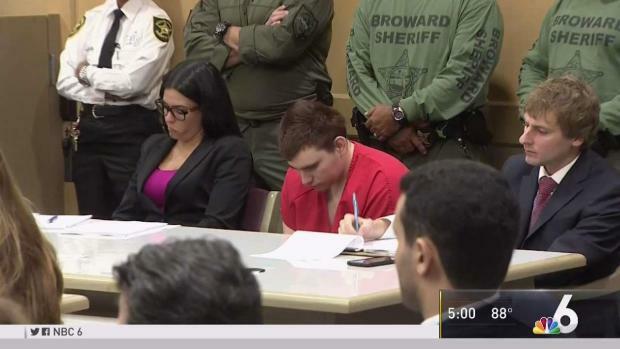 NBC 6's Jamie Guirola looks into the details of Nikolas Cruz's statements to the police made hours after the massacre. At first, Curcio did not read Cruz his Miranda rights or caution him about his right to refuse questioning, the defense claims, adding in a court motion, "Instead, Det. Curcio, in several different ways, encourages the defendant to speak." Curcio, asking about Cruz’s life history, tells him, "I only can talk to you to hear from you what was going on with you," the defense quoted him as saying in its motion to block release of the statement. The questioning, it says, was intended to assist prosecutors to establish premeditation and to undermine the "potential of the defense of insanity," the defense stated. After completing that goal, Curcio gives Cruz his Miranda rights and begins questioning him about the substance of the crime, the defense said. At other times, Curcio makes "irrelevant, prejudicial and inadmissible" statements or commentary, according to the defense. At some point, Cruz requests the presence of a psychologist but Curcio did not give him the opportunity to have one present, the defense stated. The state attorney's office released portions of Nikolas Cruz's statements he made to the police hours after the MSD massacre. NBC 6's Tony Pipitone reports. "The result is a discussion, and video presentation thereof, that is likely to be misconstrued by the public-at-large, resulting in widespread prejudice against the defendant that will prevent the seating of a fair and impartial jury," the defense argued. It is not yet clear whether that section of the statement the defense found objectionable was redacted by the judge. After Cruz invoked his right to counsel, Curcio left him alone for a while, but returned with his brother, Zachary. "I’m sorry, dude," Cruz tells his younger brother. "I'm a failure, dude." "No," Zachary replies. "You’re just lost." Also on Wednesday, a sheriff leading the state commission investigating the massacre said the suspect's behavior before the shooting was a "roller-coaster," where he would have stretches of good conduct before it deteriorated. An independent consultant's report on accused MSD gunman Nikolas Cruz's entire history with Broward County Schools was released redacted but now those redactions have been revealed. Pinellas County Sheriff Bob Gualtieri told the Marjory Stoneman Douglas High School Public Safety Commission that Cruz's fluctuating behavior through the years made it difficult for school officials to determine how he should be handled. "It was really a roller-coaster with Cruz really from birth," Gualtieri said. A report released last week by the Broward County school district said he began showing behavioral issues that got him kicked out of pre-kindergarten. He spent his school years shuttling between regular campuses and those for children with emotional and behavioral problems. 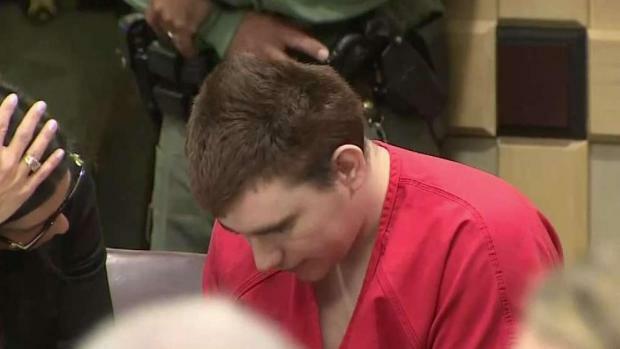 "He had some really bad low times but at times he was without behavioral issues," he added. The 14 appointed members and five ex-officio members of the commission will learn more about Cruz's educational, mental health and medical history during a closed session Thursday as they conclude their monthly two-day meeting.